One of the most important aspects of planning a successful wedding is to secure a wedding photographer that will be able to capture your special day in a way that makes you smile every time you look through your wedding album. Getting the right fit can be kind of tricky, especially in today’s market where wedding photographers are also artists. Basically, you are in a position where you have to choose whose art you think will fit you best. Today’s photographers all have blogs and Facebook pages so checking out portfolios is an easy task. Once you have narrowed down a couple of choices, however, you will need to do a little bit of work to make sure you settle on the right person for your job. Here are a couple of questions to ask potential photographers before you make your final selection. 1. Can I look through a complete album of a wedding you have shot? This may sound unnecessary, but a photo blog is going to be covered with only the best photographs in your photographer’s portfolio. The only way to establish whether you are going to be happy with your finished product is to look through someone else’s finished product. If you feel too shy to ask a photographer for a complete portfolio you might consider looking through a few friends’ albums and choosing a photographer that way. 2. Can you describe your photography style? This might be a tough question for most photographers to answer, but if you don’t like fun, flirty, quirky photographs or photographs that have been massively photo shopped for instance, it’s best to know that your photographer is more conventional or traditional or whatever it is that you are specifically looking for. 3. Do you specialise in wedding photography? Many photographers are just general studio photographers who pick up wedding work once or twice a year. This is not necessarily a bad thing, but you may feel more confident hiring someone who focuses (almost) exclusively on weddings. That way you know that even if you forget about a certain photo opportunity it is quite likely that your photographer will not. 4. Can I show you a few ideas of what I would like? If you’re a fan of Pinterest it is quite likely that you have a board filled with wedding poses that you would like to duplicate. Make sure that your photographer is ok with this before the actual wedding day so that they can make any necessary preparations. 5. How long will it take to get my photographs? It will probably take way longer than you expect to get your photographs. It takes time to get the finished product ready, but exactly how much time varies from one photographer to the next. Equip yourself with a realistic expectation of when you will get your photographs so that you don’t get edgy while you wait for them. As frustrating as it might be (yes, I know you wish you could have them ready before you leave for the honeymoon!) it can take up to six or even eight weeks before you get those photographs back. 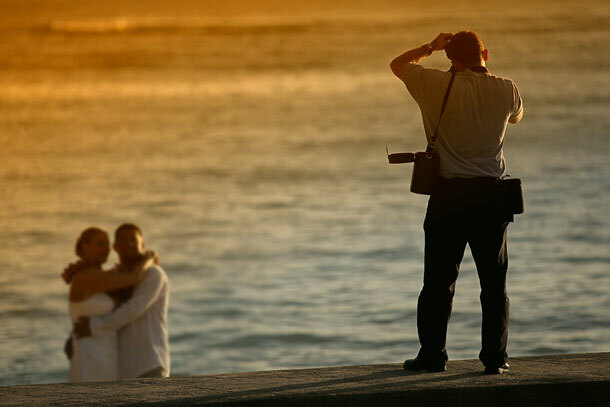 What about requesting back up photos in case the photographer loses your photos? That would kill me!